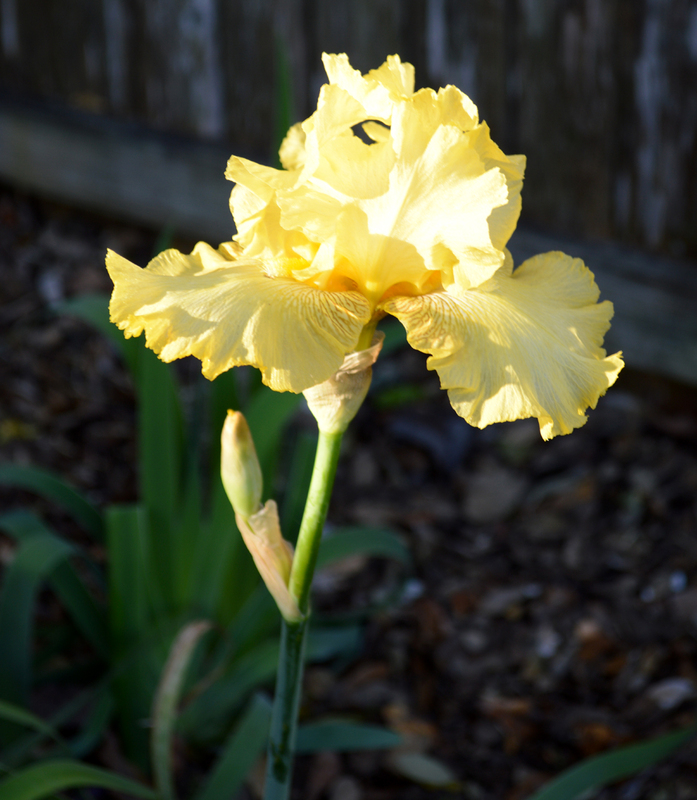 Walking in my garden this morning I got quite a surprise, an IRIS!!!! In this part of Texas they usually bloom during March and April. So I believe this beautiful yellow blossom is a Christmas present from Our Lord. It makes me think of the Star of Bethlehem and the angels announcing the birth of baby Jesus. This intricate flower created by God reminds me of the awesome Gift that He gave us over two thousand years ago, His only Son. May your Christmas be filled with His Peace, Laughter, Love and Joy! Christmas is almost here and I have a request…. As you frantically rush to get all of your last minute shopping and Christmas tasks finished please take a moment to remember the amazing people in the military. Credit is due to our U.S. service men and women for us being able to celebrate these festivities. Also to those in Law Enforcement who serve and protect us. Let’s try in this small way to pay a tiny bit of what we owe. Ask people to stop and think of our heroes, living and dead, who sacrificed themselves for us! 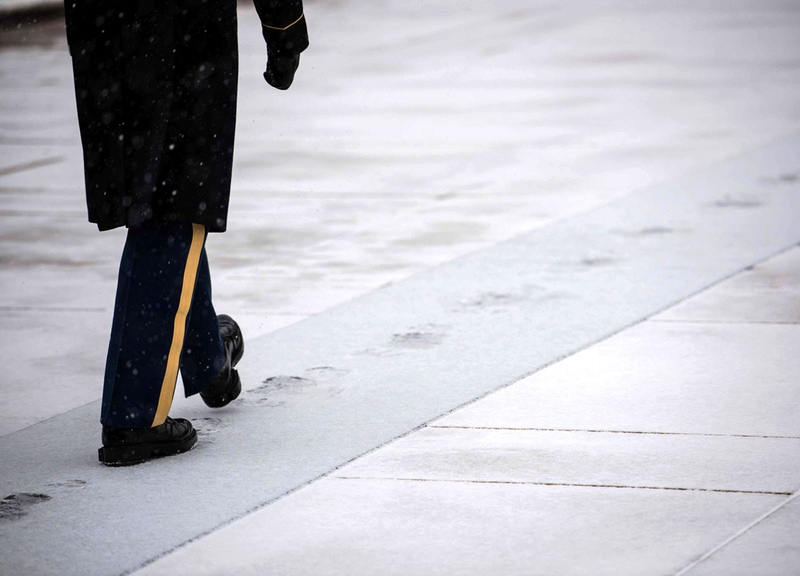 As we snuggle in our warm beds on Christmas Eve for a long winter’s nap, they are out in the cold, protecting us. This POEM is a bit long but well worth the time it takes to read. The author, LCDR Jeff Giles, SC, USN, says it all………..
Here’s a BIG THANK YOU HUG for taking time to remember the incredible men and women who serve and protect us. GOD BLESS them as well as you. MERRY CHRISTMAS! The Sunflowers behind the bench are blocked in Flowers First, Leaves Last. 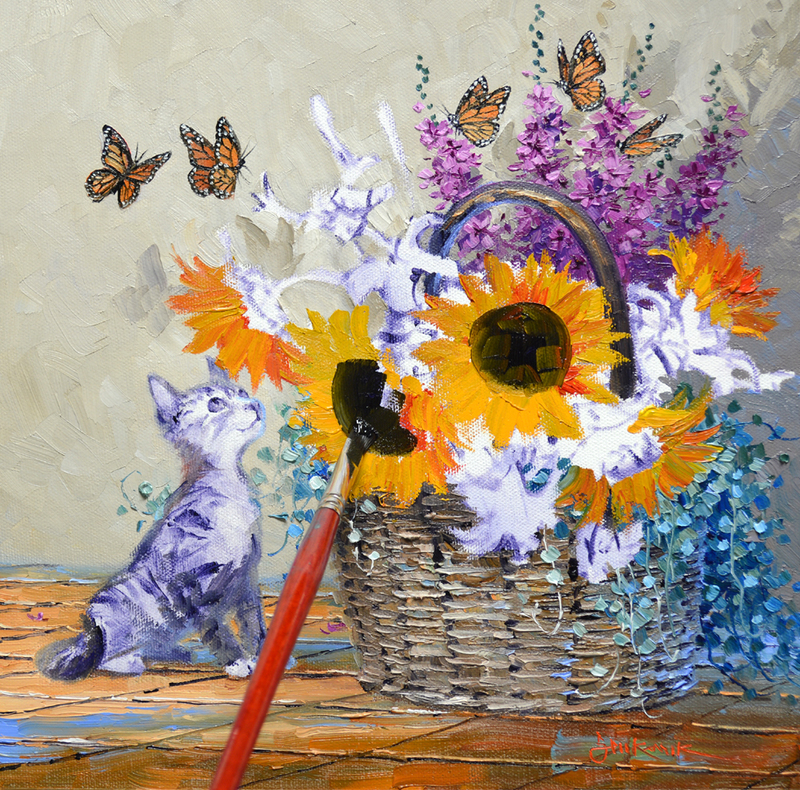 Cadmium Yellow Medium + Cadmium Orange + Alizarin Crimson, Cadmium Yellow Medium + MUD (2 parts Ultramarine Blue + 1 part Alizarin Crimson and Cadmium Yellow Medium + Cadmium Orange are used for the blossoms. 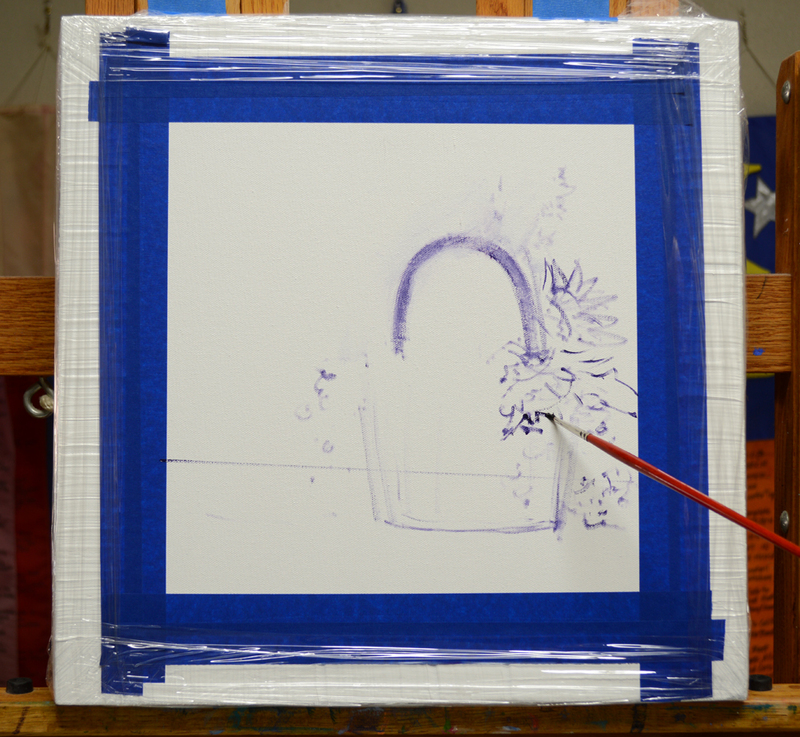 The foliage is combinations in different proportions of Ultramarine Blue + Lemon Yellow. You may click on any of the images to see them larger. The large centers of the Sunflowers are drawn into the masses of yellow with a mix of MUD + Liquin. 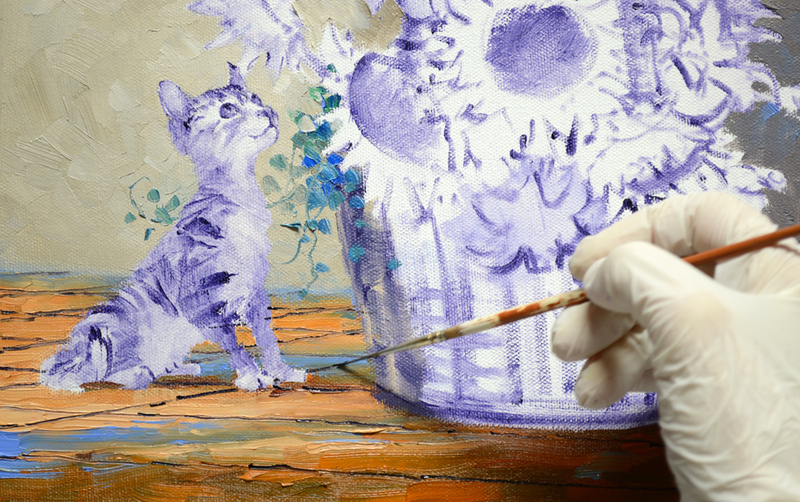 VIDEO DEMONSTRATION: Painting one of the Hummingbirds. The bright Southwestern style bench is made of mixtures of Turquoise Pthalo Blue + White. Pink Petunias are “Planted” in the terra cotta container by the bench, then a couple more Hummingbirds are added. The tall spikes of Delphinium tower over another bunch of Petunias in the planter to the left of the gate. 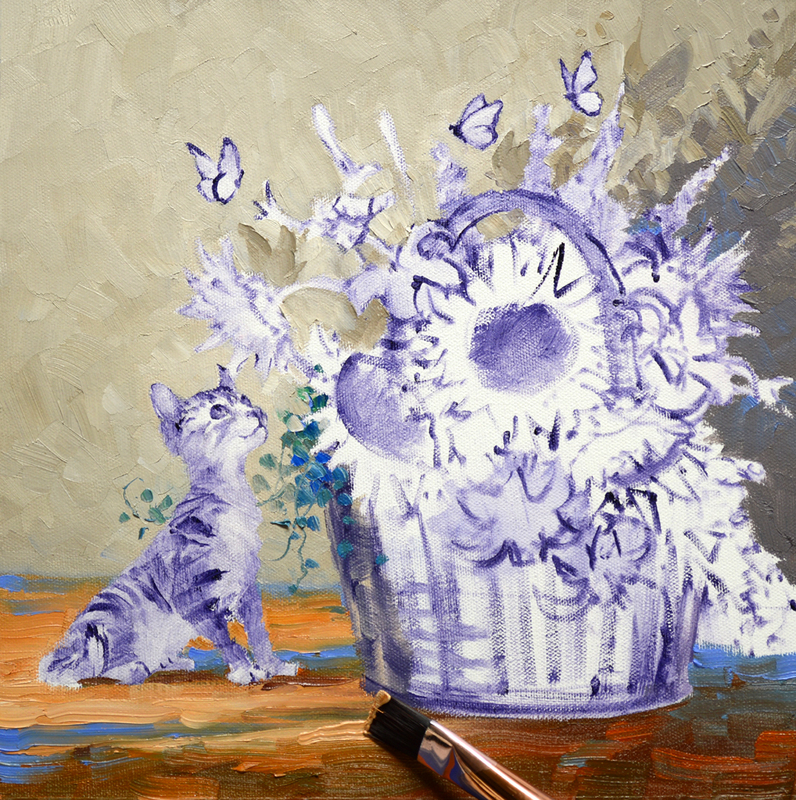 The Delphinium blossoms are mixes of Dioxazine Purple + White and Dioxazine Purple + Ultramarine Blue + White. 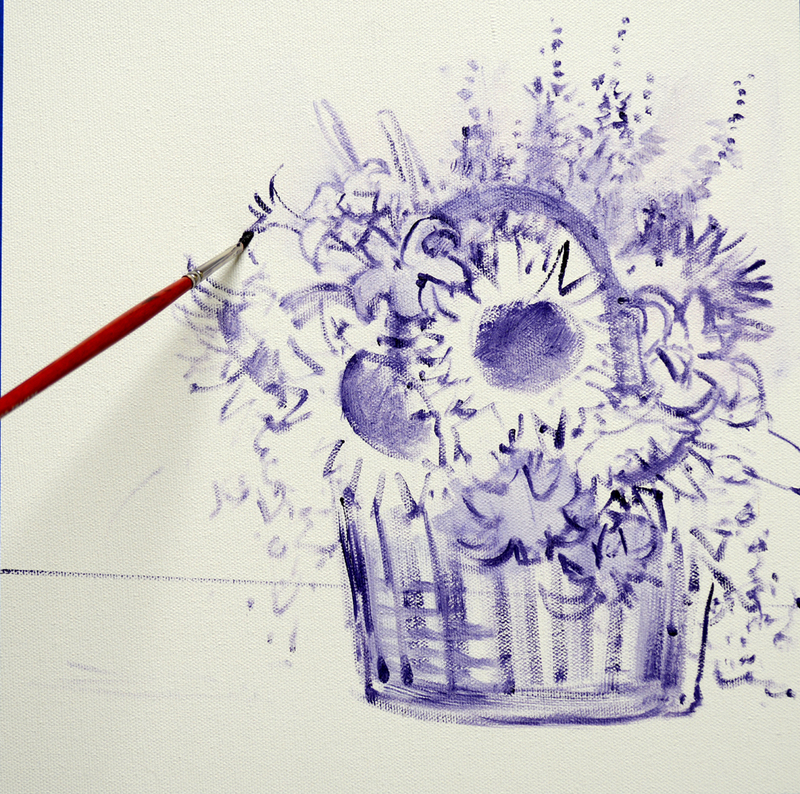 Coneflowers, made of Magenta + White and Magenta + Dioxazine Purple + White, snuggle at the base of the Delphinium. 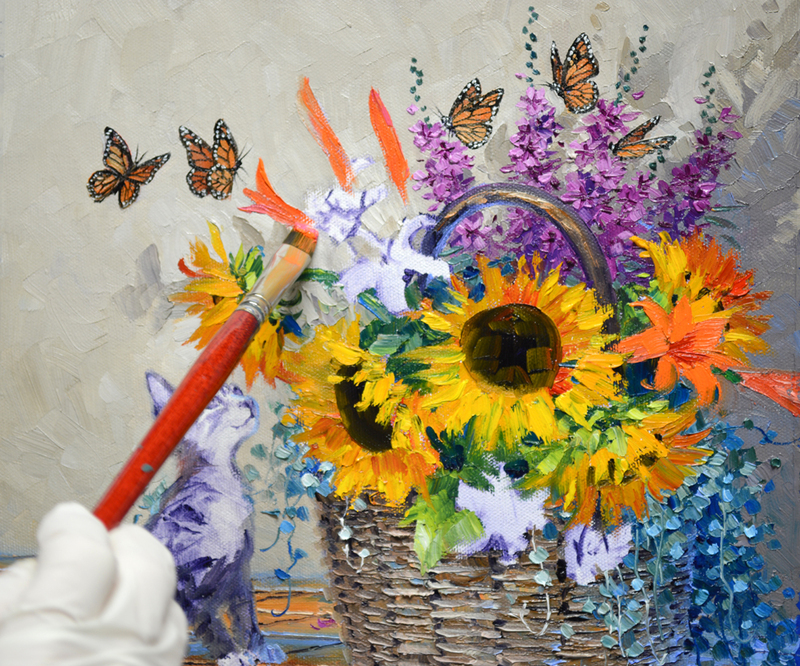 The leaves of the Coneflowers are Pthalo Blue + Cadmium Yellow Medium and Pthalo Blue + Cadmium Yellow Medium + Lemon Yellow. The sky was painted first using mixes of White + Cobalt Blue and White + Pthalo Blue. 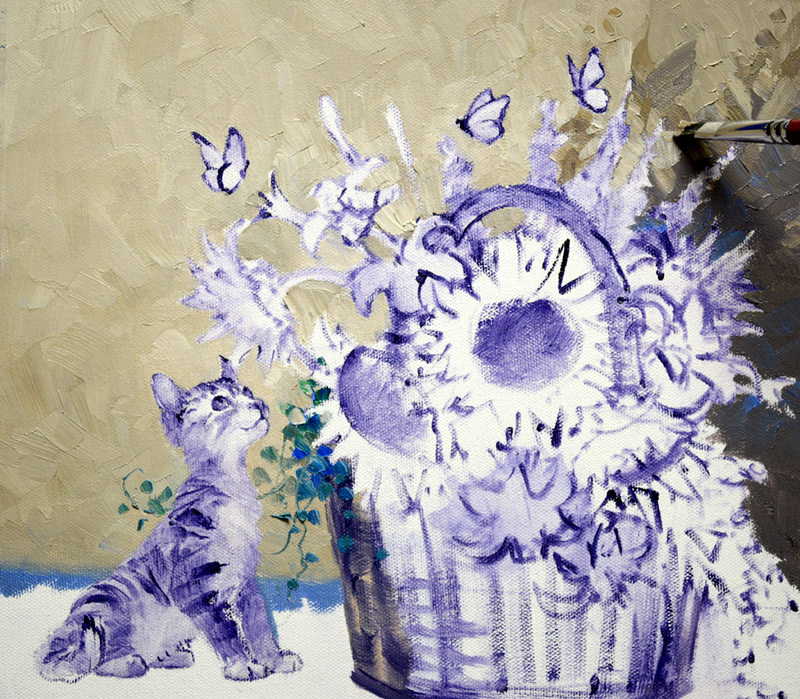 The darker Cobalt Blue mixture is used in the upper portions of the sky, the Pthalo Blue mix in the lower part. Moving forward the walls are constructed with combinations in various proportions of MUD (2 parts Ultramarine Blue + 1 part Alizarin Crimson) + Cadmium Orange + a touch of Pthalo Blue + White. 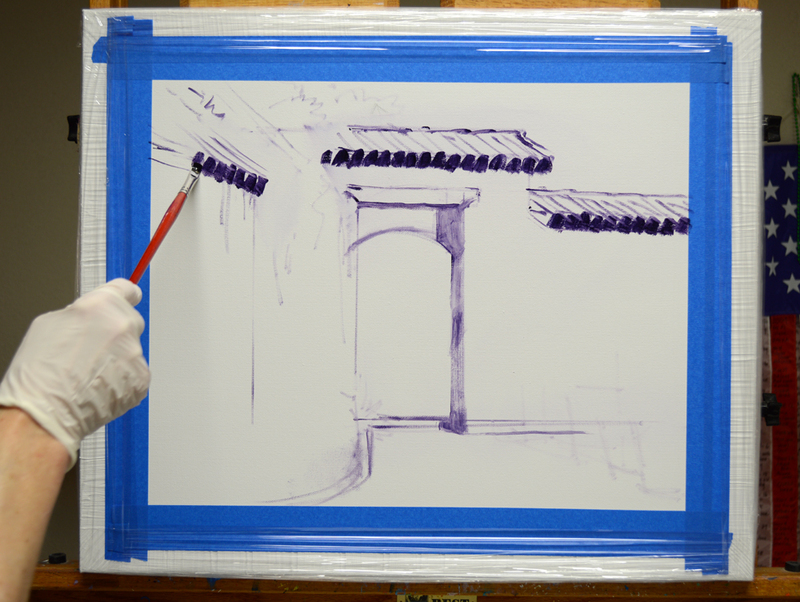 A few strokes of Ultramarine Blue + White are made on the back part of the wall on the left at the corner. This makes the wall recede. As you read through my post please keep in mind that you may click on any of the images to enlarge the picture. Sunlight pours over the structure from the upper left, illuminating the gate and adjoining wall. 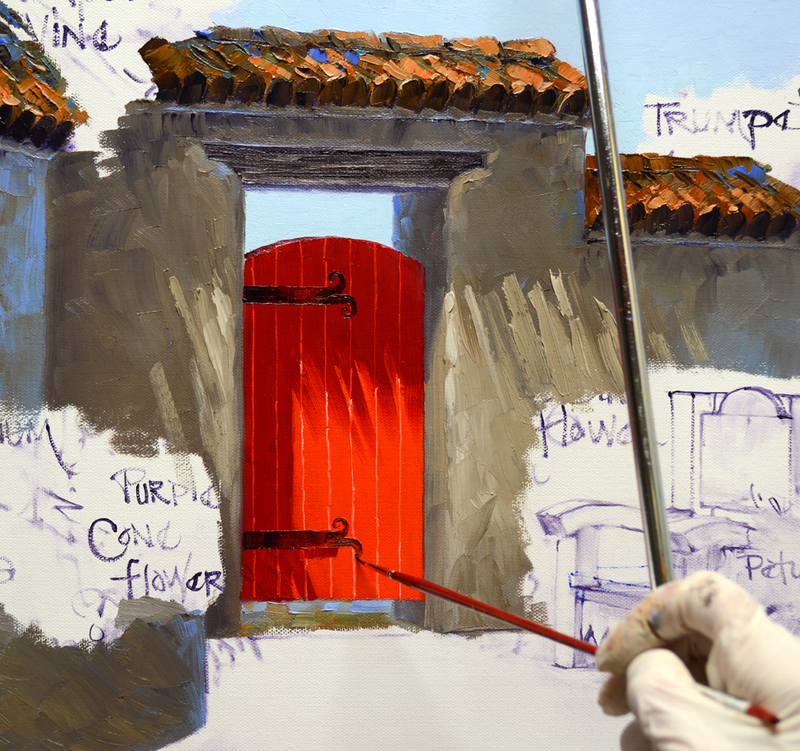 Now, let’s paint the tiles on the roof and top of the courtyard wall. 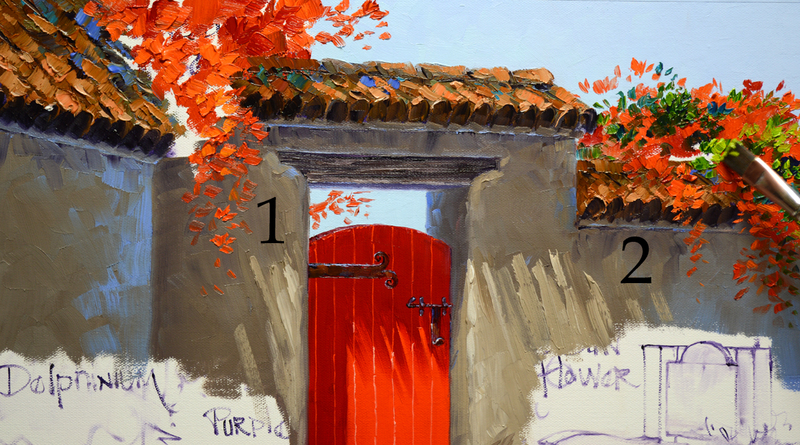 Shadows on the gate are Cadmium Red Deep + Alizarin Crimson, the sunlit portion is pure Cadmium Red Light. After delineating the edges of the boards catching the light the wrought iron hinges are drawn into the wet paint using a mix of MUD + Liquin. Rusty hinges and gate latch are complete, now for the tile floor. The entire surface is covered using oil paint remaining from the terra cotta roof tiles. My goal in this step is to establish the light and shadow pattern on the courtyard floor. 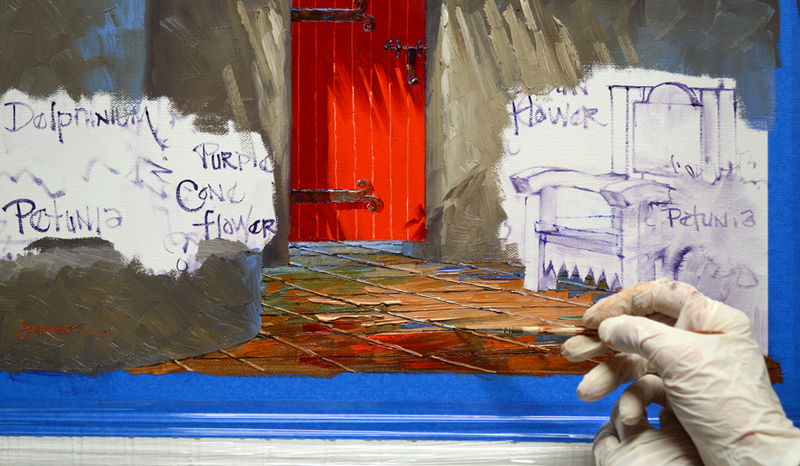 Perspective lines separating the individual tiles are drawn into the wet paint of the floor with a thin brush. Then the edges of the tiles are highlighted. 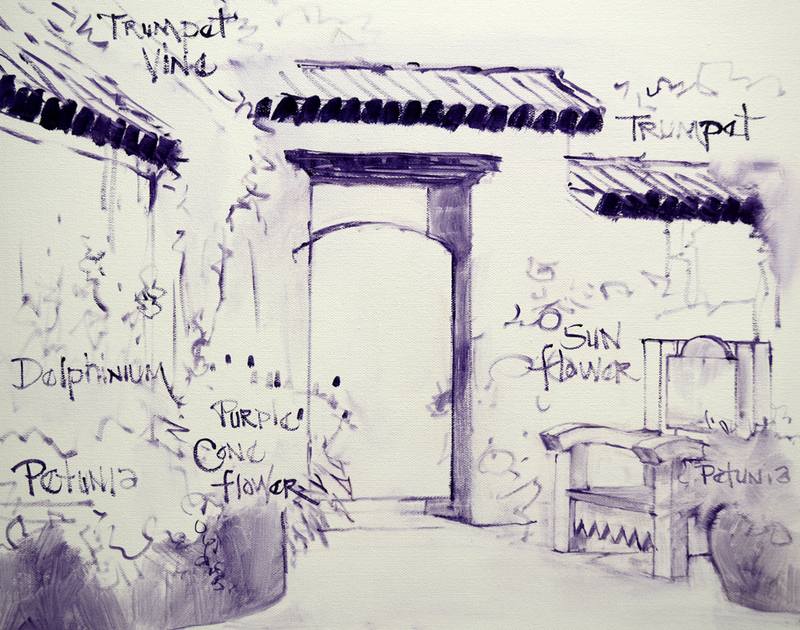 The Trumpet Vine cascading over the walls is blocked in using my usual sequence of Flowers First (1), Leaves Last (2). 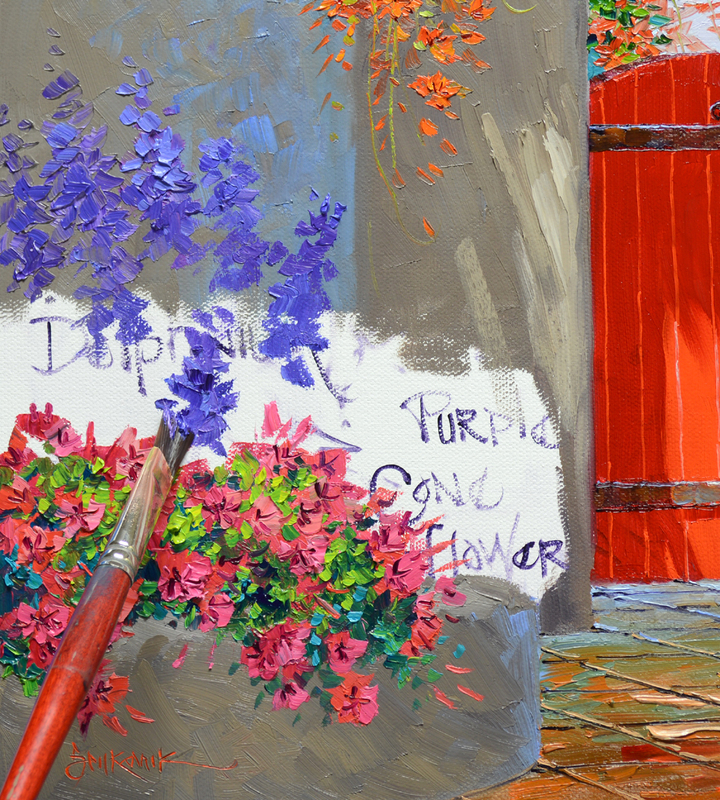 The blossoms are Cadmium Red Deep + Alizarin Crimson, Cadmium Red Light, Cadmium Orange + Alizarin Crimson and Cadmium Orange. 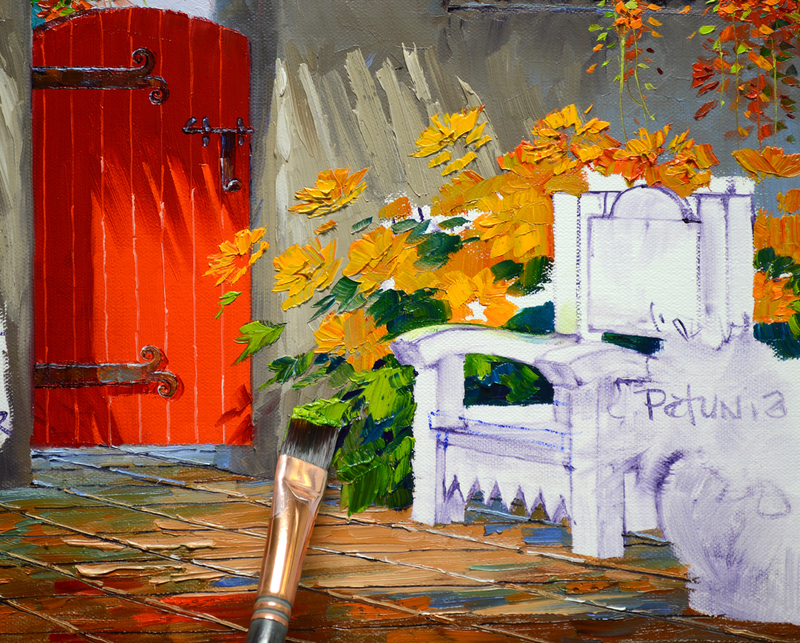 Leaves are combinations of Ultramarine Blue + Cadmium Yellow Medium + a bit of Cadmium Lemon Yellow. WHEW! I’ve been working undercover with all the elves in Santa’s workshop. Had some surprise Christmas pieces that I couldn’t show on my blog. But I’m back! 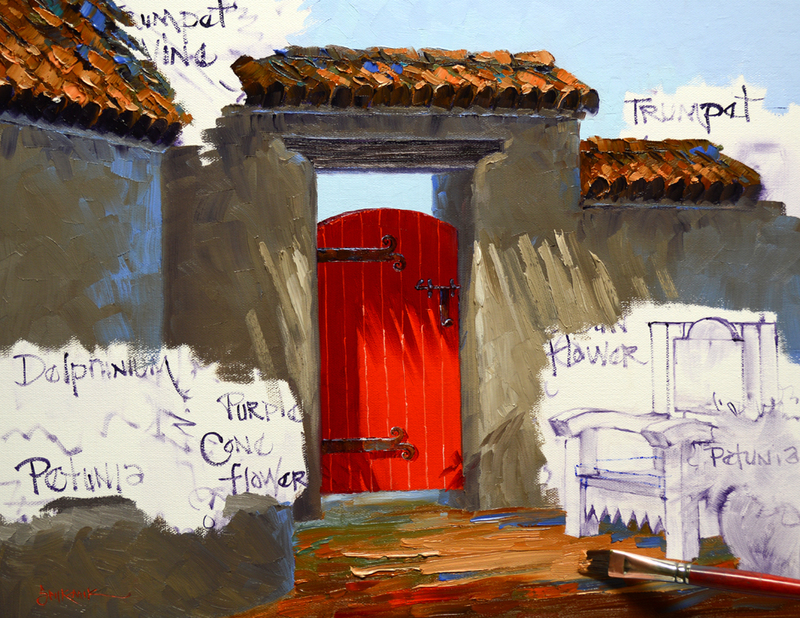 So here we go on a garden courtyard. 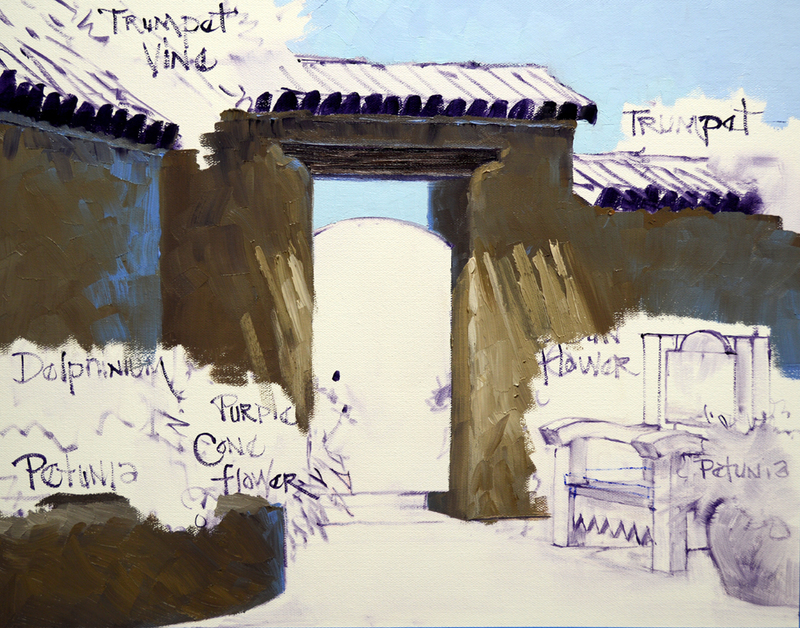 I begin sketching up the basic architecture with a thin oil wash made of MUD (2 parts Ultramarine Blue + 1 part Alizarin Crimson) + Liquin. As you read through my blog please remember, you may click on any of the images to see them larger. 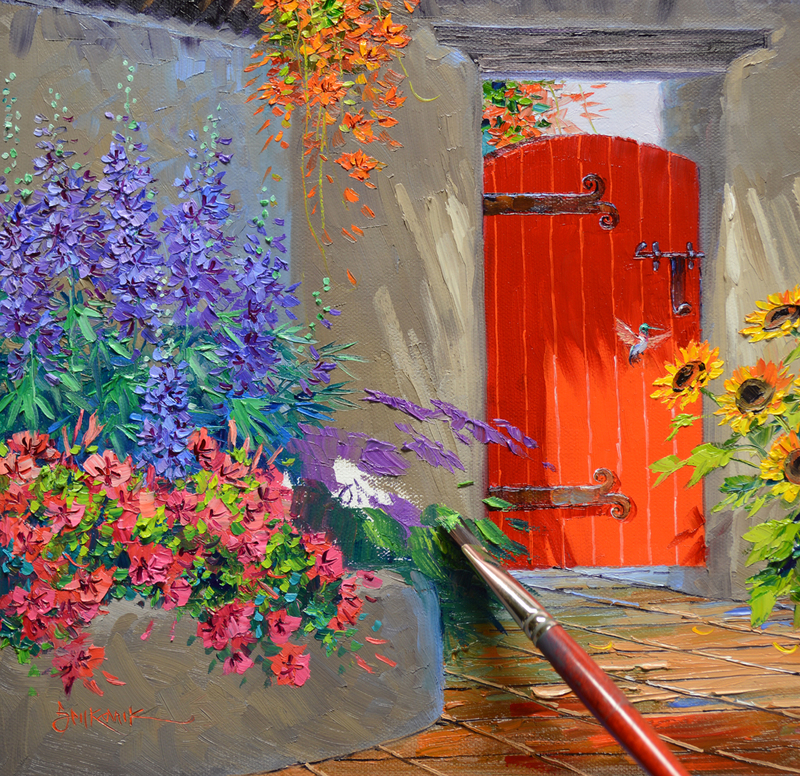 A jumble of Delphinium, Petunias and Purple Cone Flowers will fill the planter to the left of a red gate. 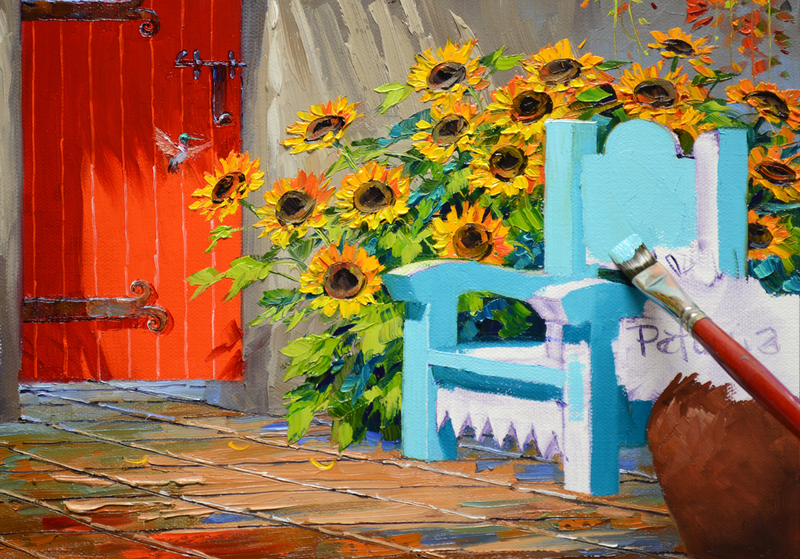 A Turquoise Bench will provide a pleasant spot to relax and take in the fragrance of the colorful blooms. 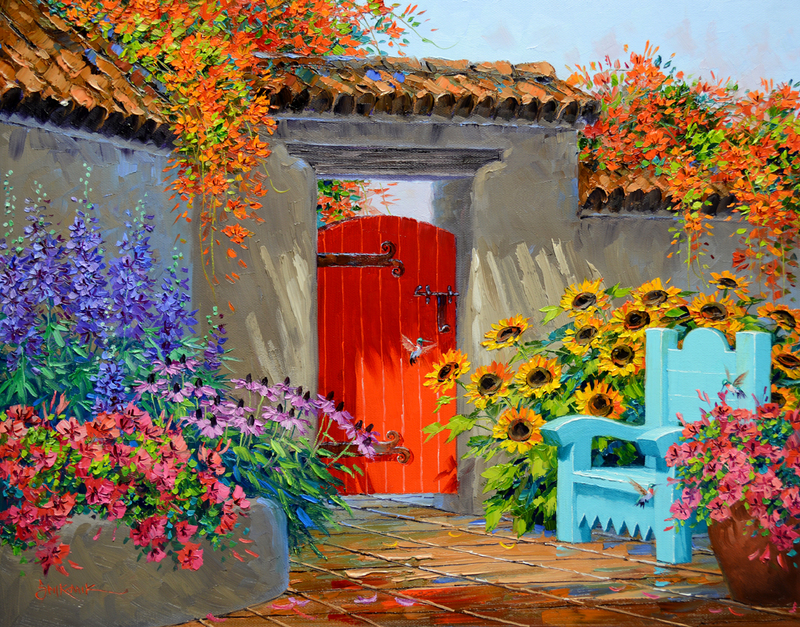 Trumpet Vine cascades over the terra cotta roof tiles while Sunflowers line the wall behind the bench. 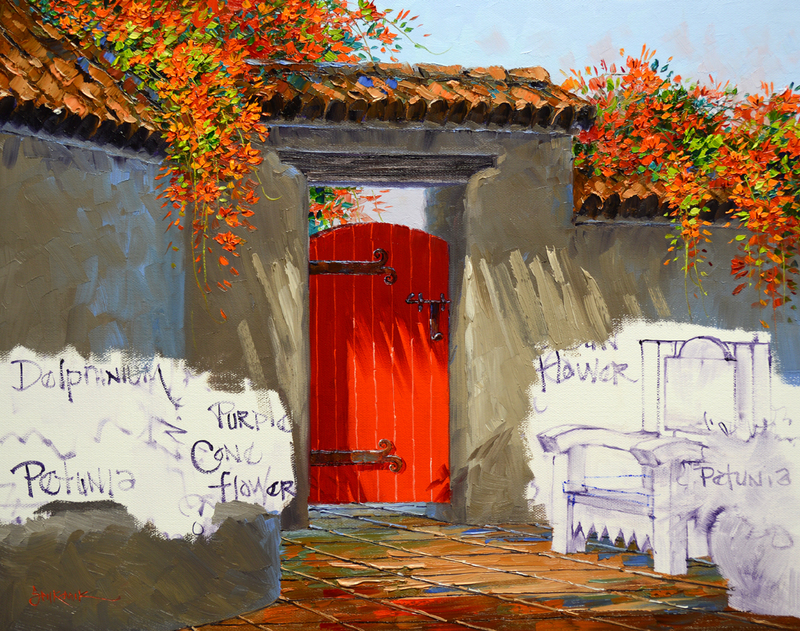 I’ll begin applying opaque Oil Paint in our next session, hope you’ll come follow along. If you would like to receive an email every time I publish a new post please feel free to subscribe to my blog. CLICK THIS LINK and scroll to the upper right side of the page. You will see a heading EMAIL SUBSCRIPTIONS. Just enter your email address and click the button “Sign me up!” It’s easy. 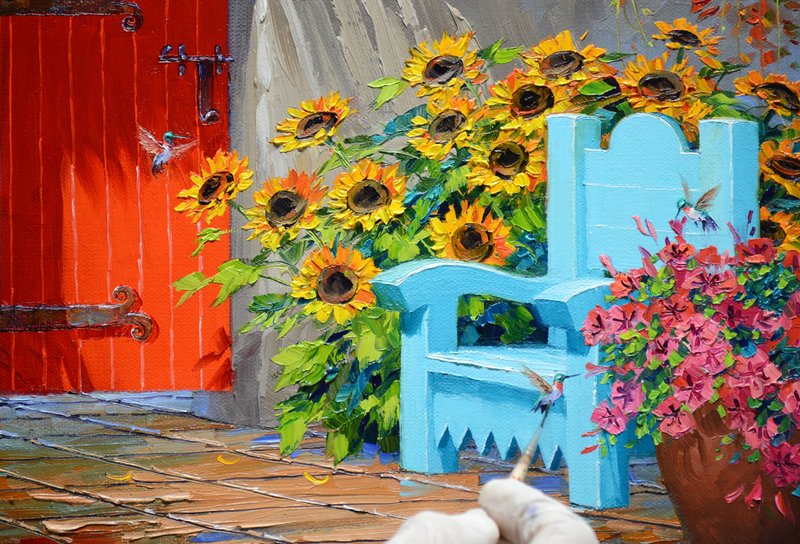 The cheery Sunflowers are first painted with mixes of Cadmium Yellow Medium + Cadmium Orange + a touch of MUD (2 parts Ultramarine Blue + 1 part Alizarin Crimson), Cadmium Yellow Medium + Alizarin Crimson and Cadmium Yellow Medium. Then the large centers are added with a combination of MUD + Liquin. You may click on this, or any of the other images to see them larger. 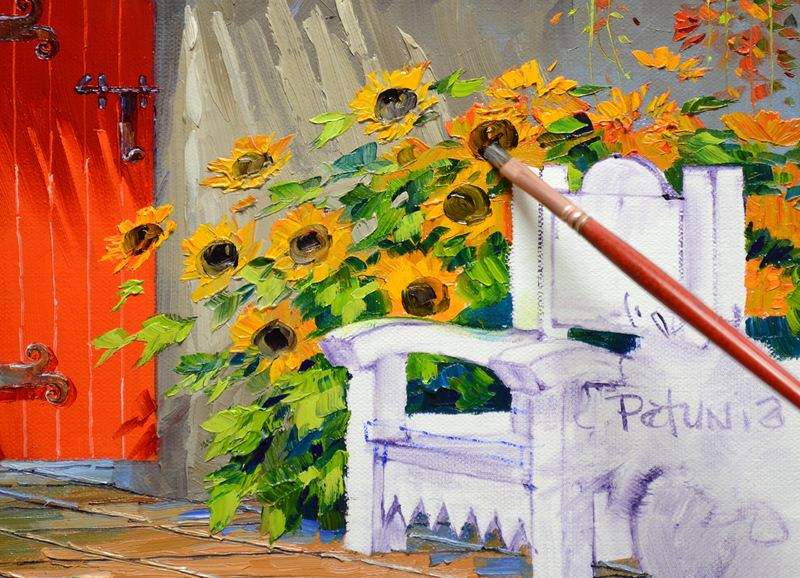 The petals of the Sunflowers illuminated by the sun are highlighted with Cadmium Yellow Medium + Lemon Yellow. Moving to the Lilies, I begin blocking them in with mixtures of Cadmium Orange + Alizarin Crimson, Cadmium Orange + Cadmium Red Light and pure Cadmium Orange. The deep centers are drawn in with Alizarin Crimson + Liquin. 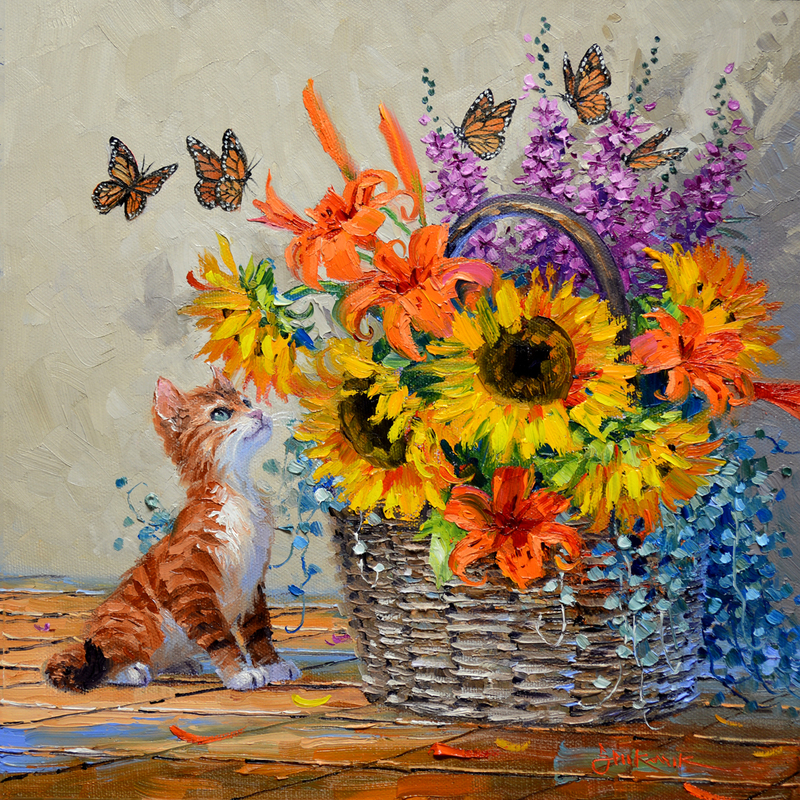 Flowers are done, let’s start on the kitty next……. We’ll start applying opaque oil color in the background with mixes in various proportions of MUD (2 parts Ultramarine Blue + 1 Part Alizarin Crimson) + Cadmium Orange + more Ultramarine Blue + White. 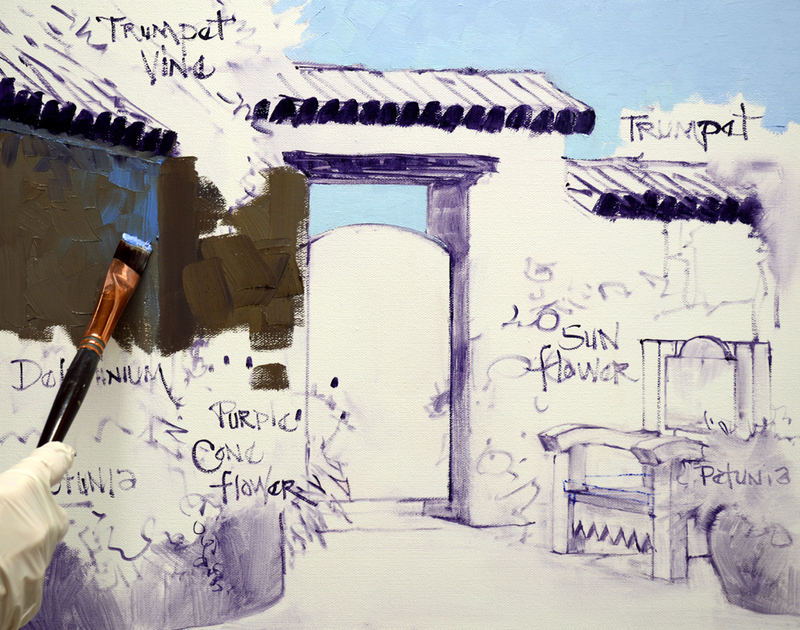 More White is used for the lighter parts of the wall, more MUD in the shadows of the flowers and butterfly. Please keep in mind as you read my blog, you may click on any of the images to seem them larger. The entire surface of the floor is covered, establishing the light and shadow pattern on the terra cotta tile. Mixtures of MUD + Cadmium Orange + a bit of Cadmium Red Light + White are used. 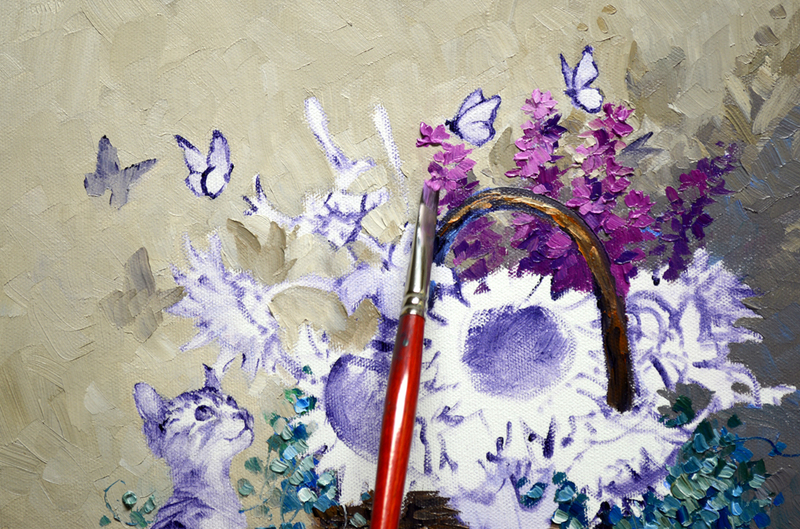 A few strokes of White + Ultramarine Blue are added at the back edge of the shadows to make them recede. 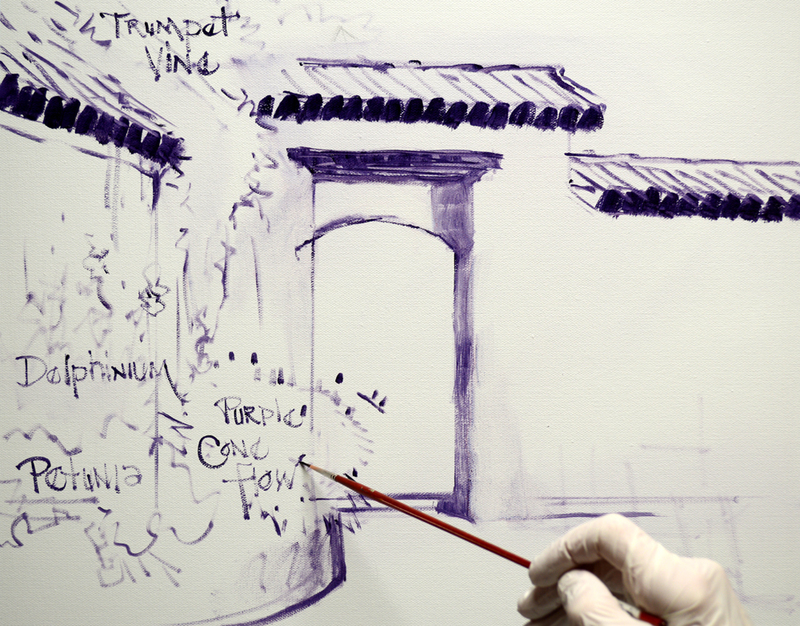 A fine liner brushed dipped in a thin oil mix of MUD + Liquin is used to delineate the crevices between the individual tiles. Colors remaining from the wall and floor are mixed together to use for the basket. The paint is applied with rough texture to help give the feel of wicker. 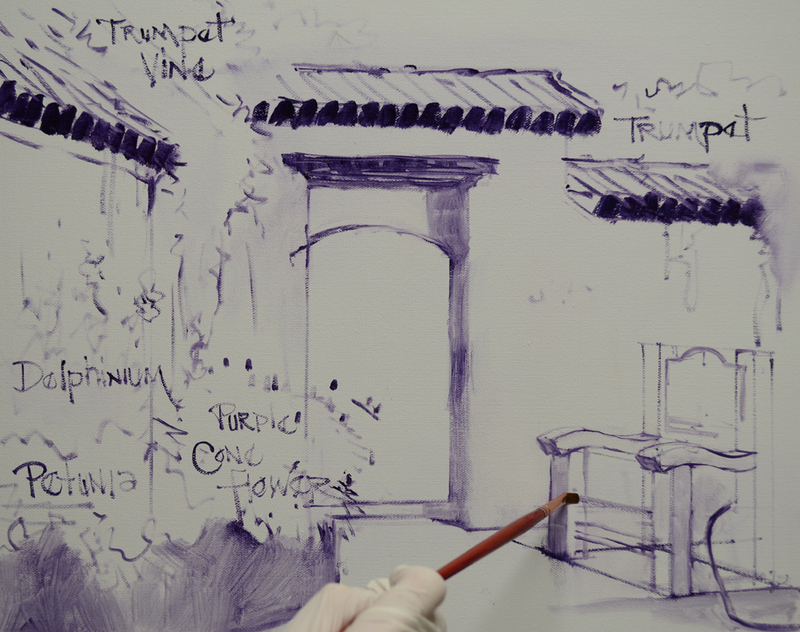 Then the ribs of the basket are drawn into the wet paint. Highlights on the basket are added. Notice how the brush stokes extend over the ribs, giving the impression of the woven wicker. The blossoms of the Angelonia are combinations of Magenta + White and Magenta + Dioxazine Purple + White. 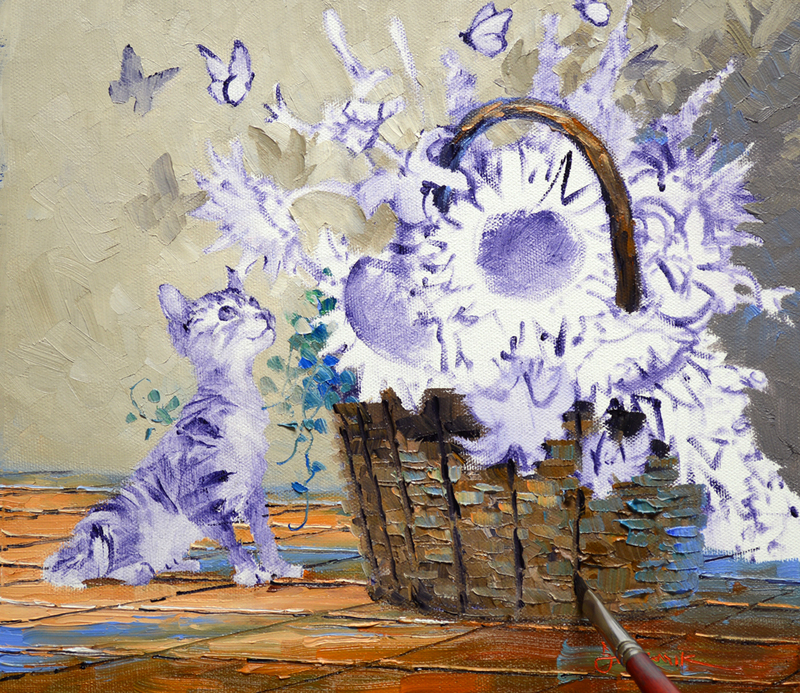 Starting on another “Kitty” painting! 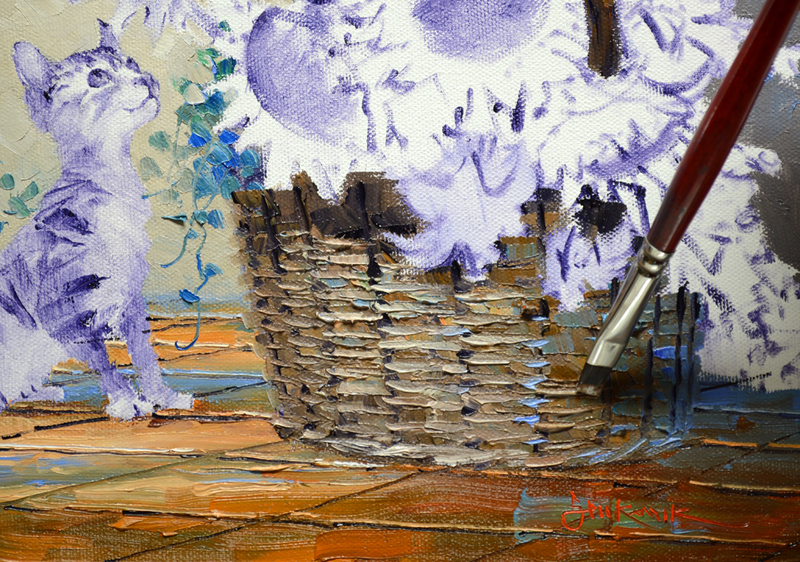 I begin by sketching in a huge basket of flowers with a brush dipped in a thin oil wash of MUD (2 parts Ultramarine Blue + 1 part Alizarin Crimson) + Liquin. 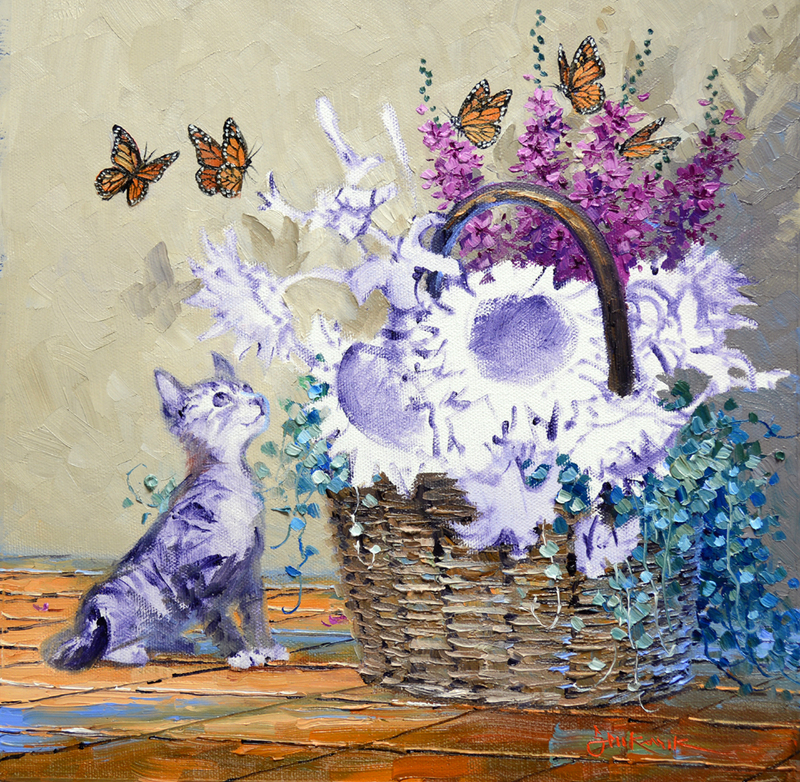 My original plan was to have Sunflowers and Magenta Angelonia with Silver Pony Foot Vine draping down the sides of the wicker basket. As I was sketching the idea of Orange Lilies popped into my mind, so I’m adding a few to the bouquet. 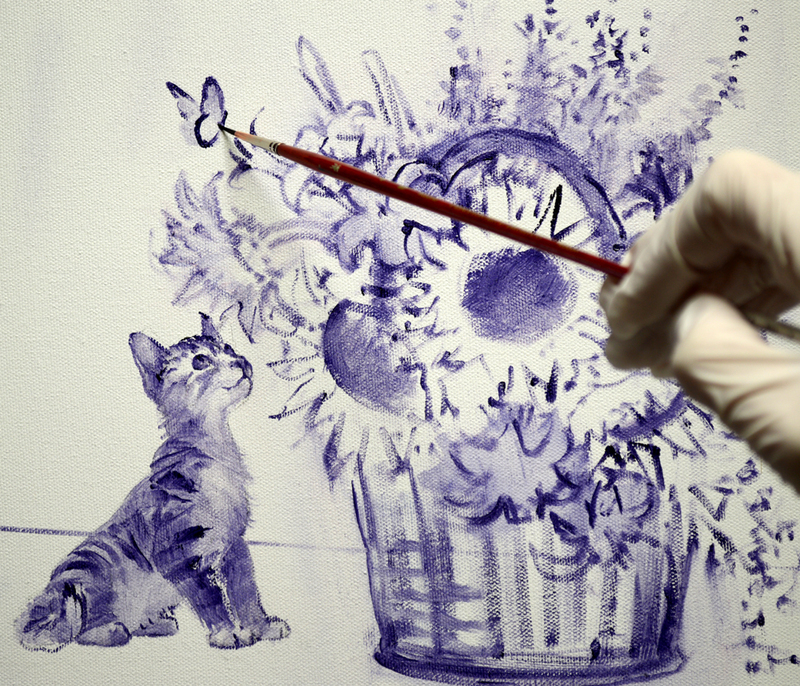 VIDEO DEMONSTRATION: Sketching the Kitty. As you’ll see I got started on the wrong foot, so had to “Begin Again”! 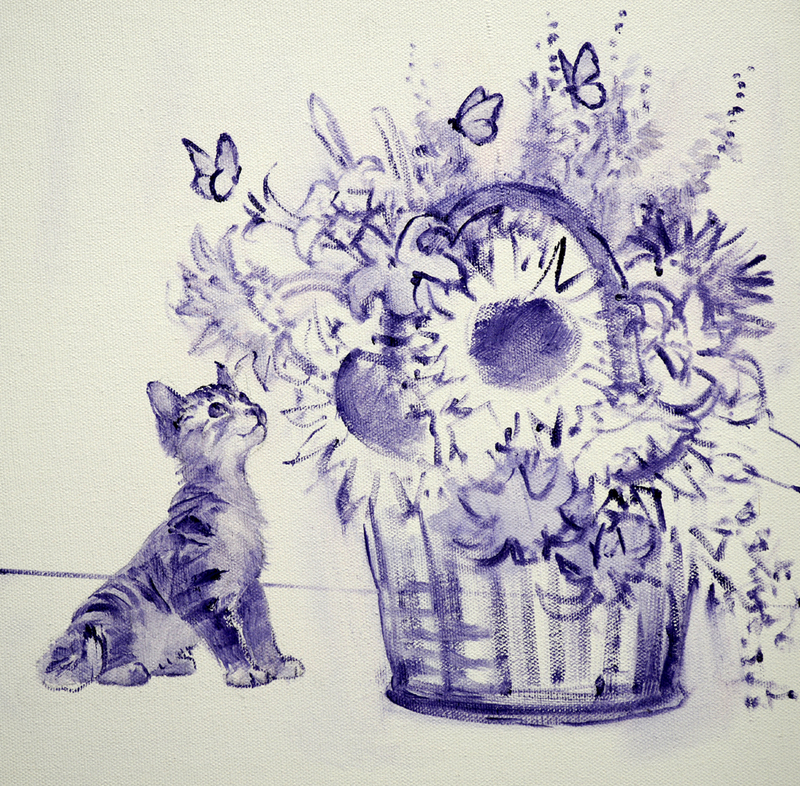 Watch how easy it is to erase and draw that kitten all over! 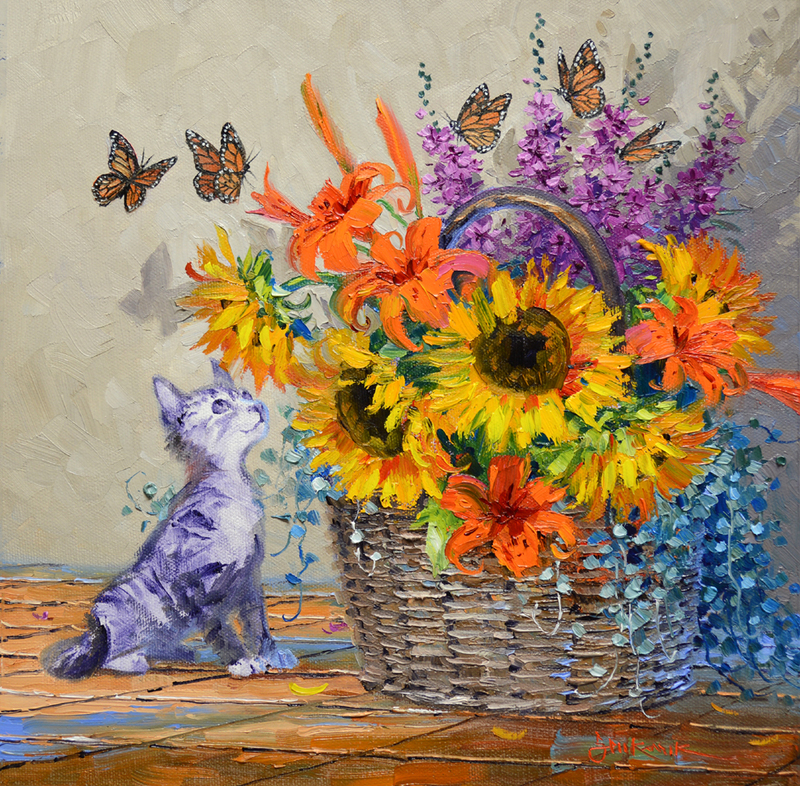 Our kitty is intently watching a “Flutter” of Monarch Butterflies fluttering around the flowers. I use reference pictures I’ve taken in our garden over the years. 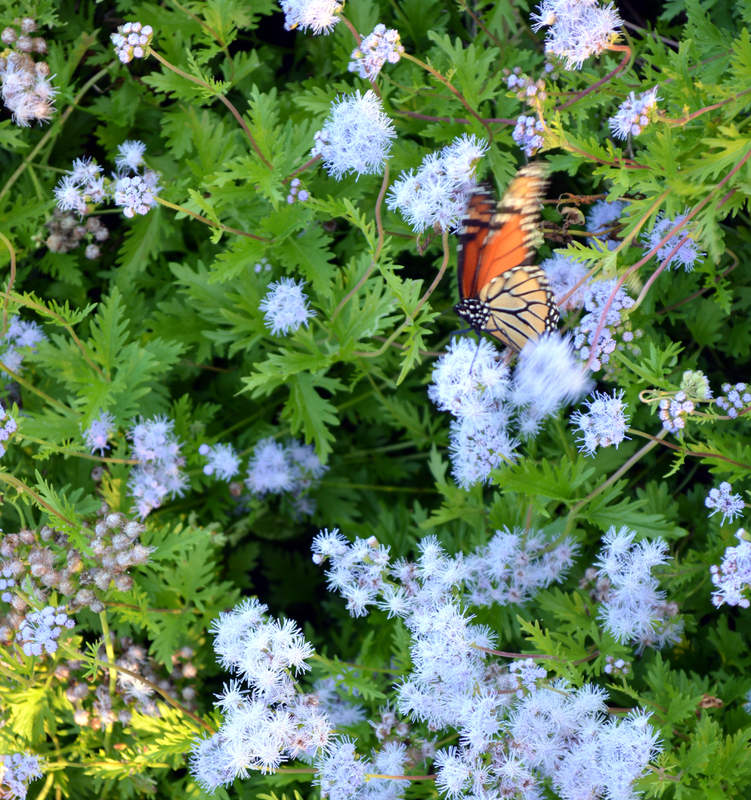 This flower is called Blue Mist. 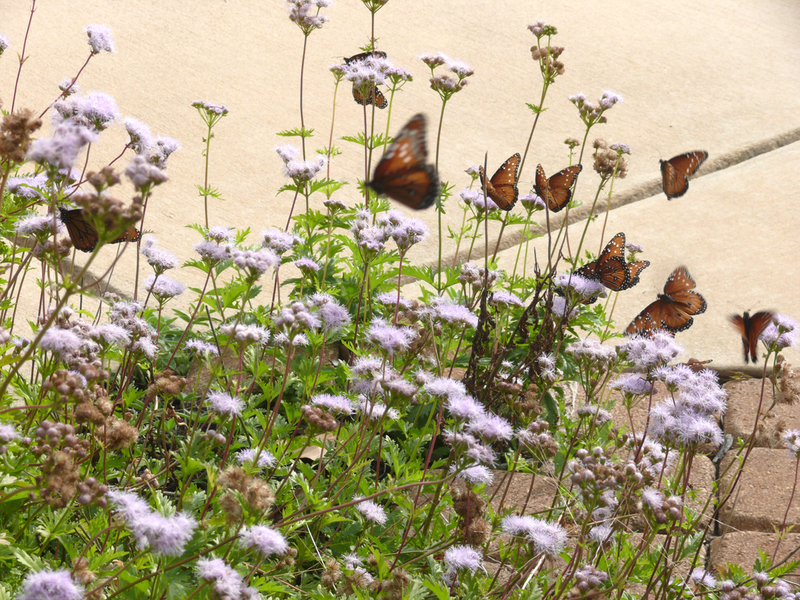 If you want to be sure you have plenty of Butterflies in your garden get some, it’s a true Butterfly Magnet! We’re all sketched up and ready to start painting in our next session. I hope you’ll come back and follow along because I’ll have more videos! If you would like to receive an email every time I publish a new post please feel free to subscribe to my blog. CLICK THIS LINK and scroll to the upper right side of the page. You will see a heading EMAIL SUBSCRIPTIONS. Just enter your email address and click the button “Sign me up!” It’s easy. Please keep in mind, to move through the blog when you get the posts just CLICK on the small titles at the top of the page. The right one for the next post or the title on the left side for the previous session. And if you enjoy my blog please CLICK the FaceBook LIKE Button. As we say in Texas, “Much Obliged!